You are a carpet cleaner. Some clients expect miracles. You need to protect yourself. This contract does just that. It provides basic legal protection in a format which will not frighten your clients. 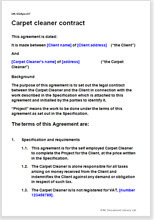 This carpet cleaner contract covers just those areas where you most need legal strength: limiting your liability if things go wrong, cash collection, payment for extras, no posting on social networks. Of course, with the wide Net Lawman experience of the real World, there are a few more helpful points too. You can use this contract with your company or as a sole trader. We provide drafting notes too, to make quite clear what the text means and to advise you on choosing from the options we give. As a carpet cleaner, you need protection. If you have not arranged for up front payment you are always at risk that your client will not pay. We give you the option of several alternative payment procedures from all up front to all on credit.